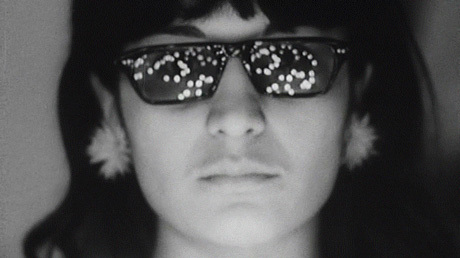 Czech director Vera Chytilova is renowned and revered outside of her homeland largely because of the wonderful freewheeling swipe at good behaviour for girls Daisies from 1966. Thank MIFF for resurrecting one of her other too-rarely screened films, the Eden story phantasmagoria Fruits of Paradise. A retelling rich in obscure symbolism, it has more of a direct narrative thrust than its more familiar ancestor, but it’s hardly an unambiguous affair. It begins with one of the most intoxicating montages I’ve seen, a five minute strobing of flora close-ups and psychedelically imposed Adam and Eve figures. The hallucinatory mood is retained through out the main body of the film, a stylised tale of Eva, her husband Josefa and the charismatic serpent like figure of Robert, who may or may not be a murderer of young women. It is almost entirely shot outdoors in those overgrown fields and forests, quarries and swamps that seem to afford such dark menace to films east of the curtain. 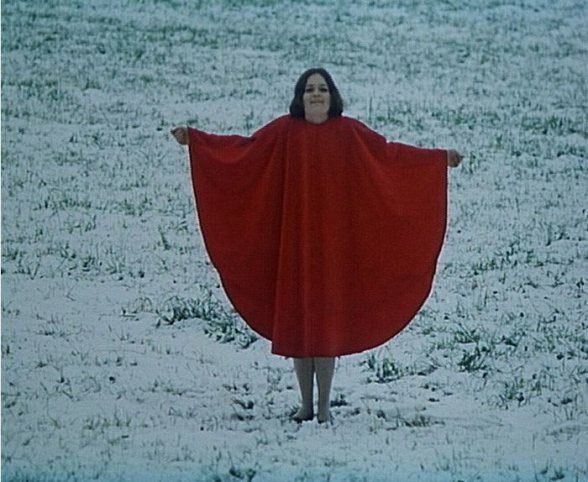 The plot, such as it is, is told in typically clever Chytilova fashion, in stylised dramatic sequences, often with jarring in-camera effects, giving the film a dreamlike mood. Despite the overriding concern with dangerous desire and a cavalcade of beautiful nudes, it is not a heated film, instead more childlike with a sinister undercurrent. The visual invention sags a bit towards the end, but a climactic chase through a twilit forest involving a long piece of blood red material is astounding. Chytilova’s way of exploring murky psychological complexity through arresting imagery is a treasure, and I hope this screening opens the way to more of her unique work seeing the light of day. A late push on MIFF’s newsfeeds meant that the screening of three of obscure Armenian director Artavazd Pelechian’s short documentary films received a surprisingly well-attended screening on the first day of the festival. His distinctive style of film essay is marked by a fluid poetry of documentary images, often manipulated in surprising ways, such as reversing film in an anti-realist loop. Of the three films, We (1969) and The Seasons (1972) are well worth seeking out. The first depicts aspects of Armenian rituals of death, social connection and urban routines with an eye for making the movements of crowds into abstract textures of pattern. Combined with a striking musical score made up of a patchwork of orchestral moments, radical electronics and frankly catchy beats, the always inventively shot sequences unfold with a rightness not bound by logic. The second film had some truly remarkable insights into the harsh trials the mountainous terrain puts rural Armenians through, mostly involving either being chased down a hill by huge bales of hay or having to transport sheep by sliding with them down uncomfortable looking scree in hair-raising descents. Longer and far less successful was the space-age collage Our Century (1982), a laborious and bafflingly repetitive compendium of Soviet rocket launches intercut with ironic and often very familiar stock clips of crashes and disasters of all forms of transport, from the Hindenburg to waterskiing accidents. While the unsubtle message of the folly of technological adventure and its inherent machismo driven risks was worthwhile, the duration was not.